Louie Bellson chronicles his own early career in this lively video interview documented by the National Association of Music Merchants (NAMM) Oral History Program. Described by Duke Ellington as “not only the world’s greatest drummer...(but also) the world’s greatest musician,” Louie Bellson had expressed himself on drums since age three. At 15, he pioneered the double bass drum set-up. 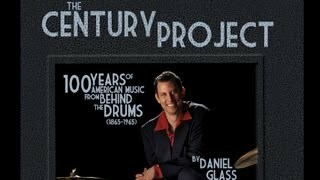 At 17, he triumphed over 40,000 drummers to win the Gene Krupa drumming contest. He performed on more than 200 albums with such greats as Duke Ellington, Count Basie, Benny Goodman, Tommy Dorsey, Harry James, Woody Herman, Sarah Vaughan, Ella Fitzgerald, Oscar Peterson, Dizzy Gillespie, Louie Armstrong, Lionel Hampton, James Brown, Sammy Davis Jr., Tony Bennett, Mel Torme, Joe Williams, Wayne Newton and Bellson’s late wife Pearl Bailey. In 1942, he performed with the Benny Goodman band and Peggy Lee in “The Power Girl”. In 1943 “The Gang’s All Here” and “Stage Door Canteen”. Louie was 24 and a veteran of the U.S. Army Band when he joined Danny Kaye, Louis Armstrong, Tommy Dorsey, Lionel Hampton, Charlie Barnett, Benny Carter, Mel Powell, Benny Goodman and others in “A Song Is Born” (1948). He served as musical director for his late wife Pearl Bailey’s concerts and TV show. Louie Bellson replaced Sonny Greer in the Duke Ellington Orchestra in 1951. He left in 1953 returning in 1956 and once more from 1965-66. His contributions to the Ellington repertoire include Skin Deep and The Hawk Talks. He also performed with Ellington on the classic Concerts of Sacred Music; on the stage production My People; and on the movie soundtrack of Assault on A Queen. 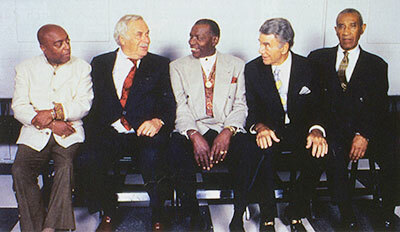 In 1966, Bellson toured briefly with both Count Basie and ex-boss Harry James. He served as musical director for his late wife both on her TV show, ABC’s The Pearl Bailey Show, and on the numerous tours they performed together. As a prolific creator of music, both written and improvised, his more than 1,000 compositions and arrangements embrace jazz, swing, romantic orchestral suites, symphonic works and ballet. As an author, he has published more than a dozen books on drums and percussion. He received the prestigious American Jazz Masters Award from the National Endowment for the Arts in 1994. Also, he is a six-time Grammy nominee. In 1998, Louie Bellson was hailed (along with Roy Haynes, Elvin Jones and Max Roach) as one of four “Living Legends of Music” when he received the American Drummers Achievement Award from the Zildjian Company. Bellson holds four honorary doctorates, the latest from DePaul University in 2001. In 2003, a historical land-marker was dedicated at his July 6, 1924 birth house in Rock Falls, Illinois, thus inaugurating their annual celebration in his honor. In March 2007, Bellson and 35 other jazz greats received the Living Jazz Legends Award from the Kennedy Center for the Performing Arts in Washington, DC. In June 2007, the American Society of Composers, Authors and Publishers inducted Bellson as a Living Legend in the ASCAP Jazz Wall of Fame ceremony, Jazz at the Lincoln Center, New York City. At age 84, Bellson passed away Feb 2009 in Los Angeles from complications of Parkinson’s disease. Survived by his manager-wife of 16 years, Francine, he was buried in Moline, Illinois, his boyhood home. In March, 2009, Illinois State Rep. Mike Boland passed a Resolution (HR0169) to honor Louie Bellson's memory in the Illinois House of Representatives. In Oct 2009, U.S. Congresswoman Diane Watson (D-L.A.) also sponsored a Resolution. In May, 2010, a memorial headstone was unveiled and dedicated at his Moline, Illinois gravesite. It was designed by his widow whose purpose was to provide a place not only for Americans, but for citizens of the World to pay respects, express pride in our heritage, reflect, and be inspired to live a life of excellence and humility. 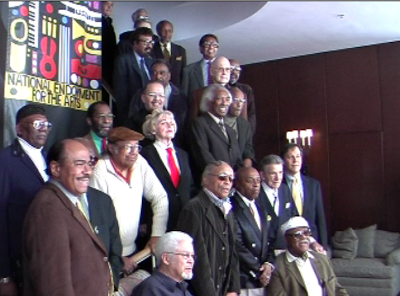 These transcriptions of oral histories of NEA Jazz Masters are part of the Smithsonian Jazz Oral History Program. Established by the Smithsonian’s National Museum of American History in 1992, the Program seized the opportunity to document more than one hundred senior jazz musicians, performers, relatives, and business associates. HEAR Bellson’s 8 extensive interviews as conducted by the Smithsonian Jazz Oral History Program. < Click logo to listen. 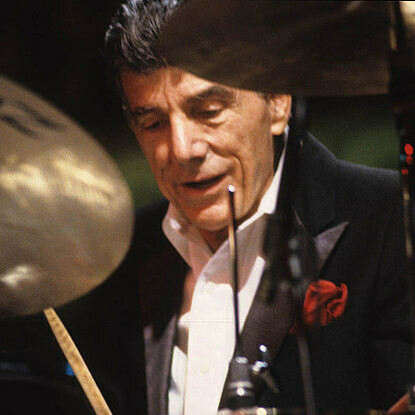 READ Comprehensive (15-page) interview of Louie Bellson by Fillius Jazz Archive Director Monk Rowe on April 12, 1996 at the Sarasota (Fla.) Jazz Festival. Here's an extensive (20-page) article on Louie Bellson by Stephen Fratallone in the March, 2005 issue of Jazz Connection Magazine. (Know someone who might be eligible? NOTE: Mrs. B was an Earlham / Harvard / M.I.T. educated physicist / engineer when she and Bellson married (1992). Mr. & Mrs. Bellson developed a joint talk entitled, “The Physicist & the Percussionist" which they performed at school events nationwide. An inspirational career presentation exploring the relationship between music and science, it was always enthusiastically received by both students and parents alike. 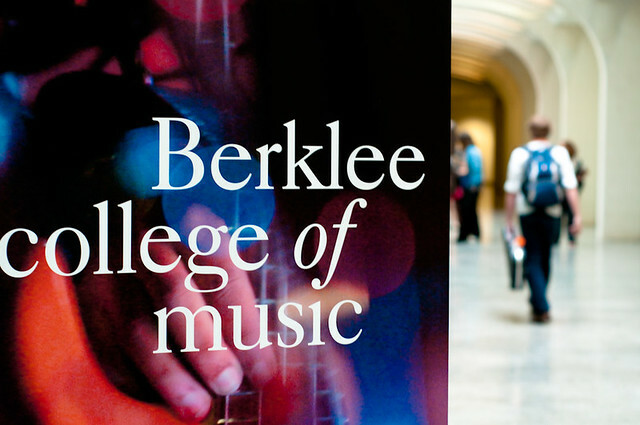 Bellson received the prestigious American Jazz Masters Award from the National Endowment for the Arts in 1994. The other inductees that year were Ahmad Jamal and Carmen McRae. In 1998, Louie Bellson was hailed (along with Roy Haynes, Elvin Jones and Max Roach) as one of four “Living Legends of Music” when he received the American Drummers Achievement Award from the Avedis Zildjian Company. (President Armand Zildjian, 2nd from left) The ceremony took place in Boston with amateur drummer Bill Cosby serving as M.C. In March 2007, Bellson (3rd rt. 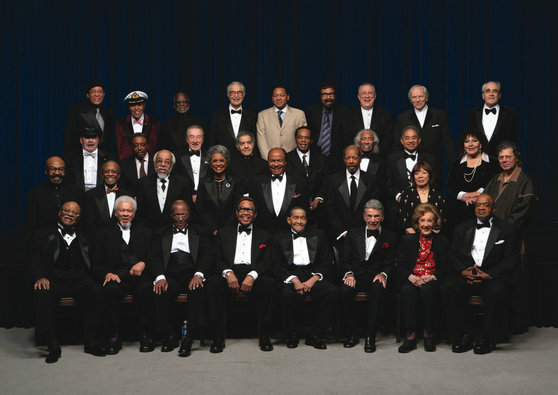 front row) and 35 other jazz greats received the Living Jazz Legends Award from the Kennedy Center for the Performing Arts in Washington, DC. In June 2007, the American Society of Composers, Authors and Publishers inducted Bellson as a Living Legend in the ASCAP Jazz Wall of Fame ceremony, Jazz at the Lincoln Center, New York City. Pictured at the ASCAP Jazz Wall of Fame reception are (l-r): ASCAP President & Chairman Marilyn Bergman, Susan Crowe (Tony Bennett's partner), vocal great Tony Bennett, drummer Louie Bellson, vibes player Terry Gibbs, lyricist Alan Bergman, bassist John Clayton and pianist-songwriter Dave Frishberg. Bellson, Gibbs and Frishberg were all honored as ASCAP Jazz Living Legends. Alan Bergman and John Clayton serve on the ASCAP Jazz Wall panel. Jazz Wall Living Legends Terry Gibbs and Louie Bellson enjoy the event. Note Mrs. B in background. (Click either photo for more pics). For a chronological listing of Louie Bellson CDs, click Discography. 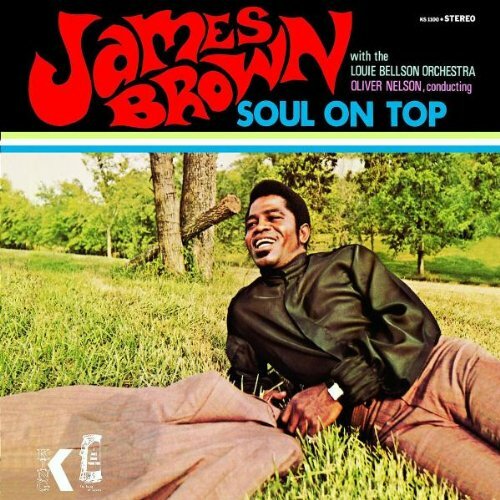 Sept 6, 2006 - James Brown, Louie Bellson and Christian McBride performed at the Hollywood Bowl in a revisit to their 1969 album, "SOUL ON TOP." Seems there was wide difference of opinion (a chasm!) over this celebrated concert, only three months before the Godfather's untimely death at Christmas. For listing of these accolades, see (click) Posthumous Honors subpage. Go to (click) Site-Seeing subpage. Return to page top (or click this arrow) to select pages. Now Entering the Bellson Time Zone . . . Once you go in, you won't want to come out! !